That Thanksgiving dinner is something we all look forward. The aftermath, of leftovers and dirty dishes and kitchen chaos, is of course worth the price. But the benefits do not end on that Thursday night. You have leftovers and you can enjoy them with relish equal to Thursday. By Sunday night, you may want a meal that is rich, but not too rich. Satisfying, but not too heavy. This soup, complete with fall root vegetables, is perfect. 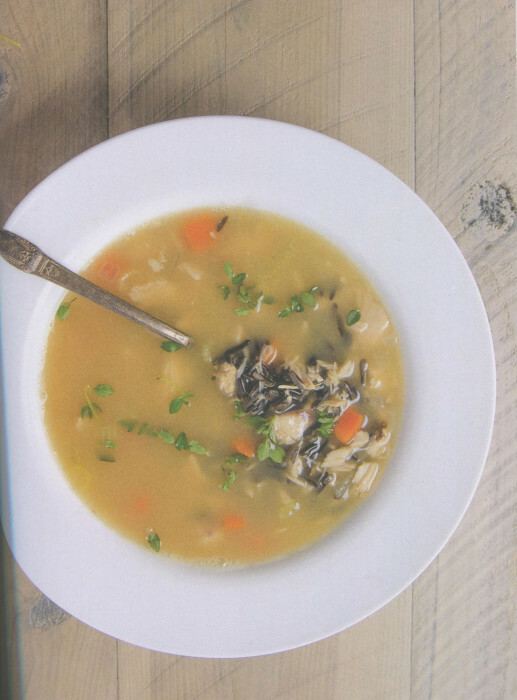 This soup uses turkey bone broth and you can find the post with the recipe right here. So, put that turkey to full use: on Thanksgiving, making the broth, and sipping this soup. Pour the rice into a mixing bowl, cover with warm water by 1 inch, and stir in the vinegar. Cover the bowl loosely with a kitchen towel to prevent stray debris from falling in. Let the rice soak overnight, at least 8 and up to 24 hours, then drain it, discarding the water. Melt the butter in a heavy soup pot over medium heat. When the butter begins to foam and froth, turn the temperature down to medium-low and toss in the onion, garlic, carrots, parsnips, celeriac, and thyme. Sprinkle the salt over the vegetables and cover the pot, allowing the vegetables to sweat, undisturbed, until tender, about 10 minutes. Give the vegetables one quick stir and then add the cooked turkey and soaked wild rice. Pour in the broth and simmer, covered, until the rice is tender, about 45 minutes.